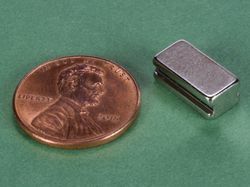 This arc segment is designed so that 12 of them will combine to form a ring of 4" od x 2" id. They are magnetized across the 30º sweep, so they attract side-to-side to form the ring. 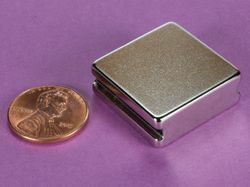 They can be used with any of our 1" x 1" x any thickness blocks to create an 1" x 1" area with an intense magnetic field. 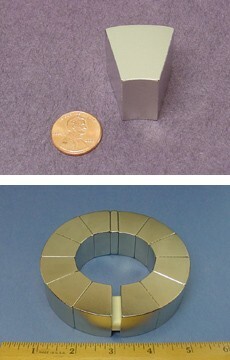 Using 12 of these rings with one of our BX0X04 blocks, as shown in the bottom picture to the left, provides a 1" square area with a magnetic field of over 11,250 Gauss. These can also be combined with our AY0X030-N and AY0X030-S to form a circular Halbach array.